This report details utility-scale renewable energy projects on Arizona’s public, private, Native American, and military land. Utility-scale is defined as all projects greater than one megawatt. This report is an update to the 2013, 2011, and 2009 reports conducted by Northern Arizona University (NAU). For each county, Native American tribe, and military jurisdiction, details are presented on the size, technology, and status of projects. For areas where there haven’t been any utility scale developments, we outline the priorities for renewable energy development and in some cases highlight smaller-scale installations. This information was gathered through direct contact with government employees, tribal members, and online searches. 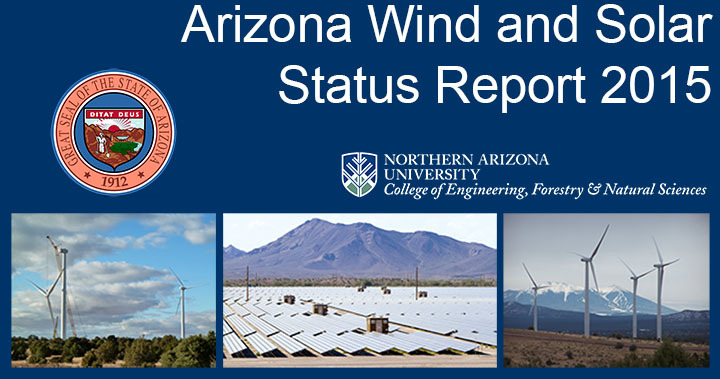 The goal of this report is to provide a snapshot of the renewable energy development that is occurring across the state’s multiple political jurisdictions, in order to help policymakers and stakeholders understand the status of, and trends in, renewable energy development in Arizona. There are 1800 megawatts (MW) of utility-scale wind and solar capacity operating and under construction in Arizona: 1,532 MW of solar and 268 MW of wind. Maricopa County leads the counties in solar development with 825.5 MW of projects completed. The Dry Lake wind farm in Navajo County is the largest wind farm in Arizona with 128 MW capacity. There are not yet utility-scale renewable energy projects on tribal lands, but there are many smaller projects and there is interest in, and progress toward, utility-scale development. Each military branch has internal goals for increasing the percentage of renewable energy it uses. Figure 1. Utility-scale renewable generation capacity by type (total 1724 MW). This report begins with a general introduction to renewable energy development in Arizona, a summary of market trends, updates on regulatory issues, and a discussion of the environmental impacts of renewable energy development. Additional sections include technological descriptions of the differing renewable energy generators, modeling of economic impacts from renewable energy development, resource maps, installed capacity maps, and appendices that include additional resources and links to permitting guidelines. Throughout the report, projects are defined as under development, under construction, or operating. Projects that are under development have been publicly proposed or are going through the permitting process and/or seeking additional funding or developers. Proposed and under development projects may or may not ever be realized. Under construction means the projects have broken ground and are in the process of being built. Finally, operating projects have been completed and are currently generating and selling electricity. For each jurisdiction detailed in the report, the population, size and median household income is provided. This information was found through The United States Census Bureau as well as demographic analysis done by Northern Arizona University and The Arizona Rural Policy Institute. The area of the state of Arizona is 113,594 square miles, and the median household income statewide is $50,256. Northern Arizona University would like to thank our many partners who assisted us with this project, including all of the tribal partners, military personnel, and city and county staff members. NOTE: This product is for informational purposes and is not considered complete. It has not been prepared for, nor is it suitable for legal, engineering, or surveying purposes. Users should review or consult primary data and information sources to ascertain the usability of the information. There are no warranties, expressed or implied, accompanying this product. This report is current as of 05/15/15.